"We believe in giving all our clients whether big or small equal importance, attention and commitment." It is a 15-member company that brings together four young-bloods from diversified backgrounds. 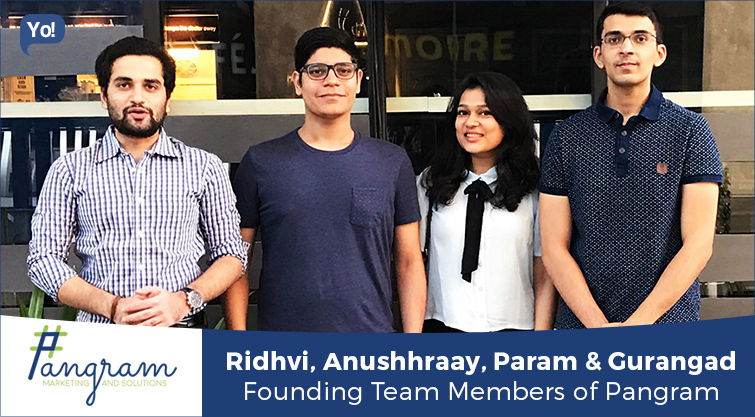 While Anushhraay (23-year-old) and Gurangad (22-year-old) belong to the financial background, Param (23-year-old) and Ridhvi (22-year-old) hold their specialty in Marketing. We are a full-service marketing and solutions agency comprised of creative graphic designers, tech nerds, mind-boggling storytellers and cunning strategists. Our primary goal is to create awareness for brands at a reasonable cost while portraying them according to their unique qualities, what appeals to their potential customers and in a modern, attractive profile that is in conjunction with the leaders in the social media space. Today a brand is shaped more by what their consumers say than what the brand tells them, therefore social media cannot be treated as an afterthought, it needs to be integrated into an overall marketing plan. We live in a social world. Consumers are looking for human connections with the brands they buy as well as looking closer at the role brands play in society. You can’t adapt advertising messaging for social media. Advertising is about selling and telling, social media is about storytelling, engagement, and socialization. Social is about creating audiences and which is different than traditional “targeting” of consumers. It’s about thinking like a publisher, not a marketer. Advanced methodologies and deep insights into clients’ industries helps distinguish our service, with our success coming from good relations with clients, regional partners, employees and local communities. We conduct business on the basis of marketing research, however, our knowledge and skills reach into various disciplines, such as brand management, management consulting, innovations, media, trend forecasting, web strategies and event management. These marketing and business skills allow us to tap a rich seam of insights to help offer valuable marketing advice to our clients. In a steadily expanding market, we differentiate by providing high-quality service at the lowest rates, not only helping our clients by marketing on various social media platforms but providing them with essential business expansion services such as guerrilla marketing, logo design and branding, PR, website development, SEOs and print collaterals. Our list of services on offer is ever growing as we strive to offer business solutions across all areas, with our objective to be the one-stop-shop for our clients to meet all their needs, as integration across their requirements brings about a cohesion that only aids business development. Understanding key market developments and ever-evolving consumer tastes and preferences are key to our understanding of any brand. This allows us to introduce a fresh new outlook, even to well-established brands, to make sure they stay up to date with their representation in both physical and digital media. Similarly, we also look at new entrants in established and non-established markets to apply what we’ve learned and made sure that brands are set up in the correct way. We were motivated to move away from the belief that marketing is an expensive service to provide quality and cost effective services to all clients no matter the size of their business. We are never completely learned. Marketing is continuously evolving and we are always learning and growing. We are four partners from four very different backgrounds. People around us tried to demotivate us about this, saying that how can we work together if we have nothing in common. But really the challenge was integrating and synchronizing our differences into our strength and proving everyone wrong. And I am glad that we have been able to do this. Another challenge we faced is our age, people found it difficult to take 4 just-graduates seriously. We had to prove ourselves through our work and make our clients build their faith in us. To do so, in the beginning we delivered work way below market rate and sometimes even over delivered just so that our initial clients could put their trust in our work. We are a startup comprising not only of professionals but also recent graduates. We believe in training and recruiting students because they are enthusiastic and ready to learn and grow. Never say no to any assignment, figure out a way to do it whether it is small or big because it leads to better client relations and expansion. To be able to market and sell any product/ service from any industry on a digital platform in sync with the Digital India movement by our Prime Minister.